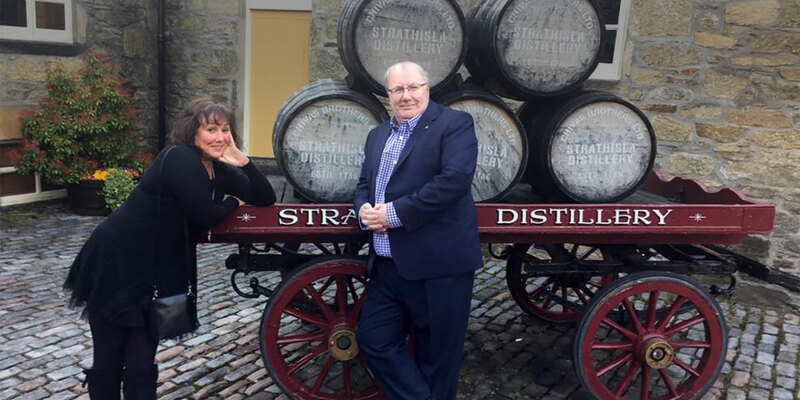 Liz and Paul of MCLEANSCOTLAND attended the 2015 Speyside whisky festival (Spirit of Speyside). As guests of The Glenlivet, we did enjoy our wee outing. It made a nice change from taking our guests to Glenlivet (Strathisla and Aberlour) to being taken there ourselves! We had our very own guide/hosts in Rachel MacDonald and James Collins, Ambassadors. FRIDAY 1 MAY We took the early (and I mean early! 6am) morning train to Aberdeen and then Elgin, where we met up with Rachel and James – our driver/hosts. We four set out from Elgin to The Glenlivet Distillery to partake and enjoy the Dram Room Specials – a tasting from the Glenlivet range; a handpicked selection of some of the best limited edition whiskies, mostly single casks. The whiskies where sampled in the Malt Loft. They included 3 cask strength, a single cask expressions of The Glenlivet – Valiant, Uisge Beatha and Auchbreck bottled exclusively for the Festival. In addition we tasted the 1983 Cellar Collection, vatted from a limited selection of casks and finished for its last couple of years of maturation in French Limousin oak casks before bottled in 2003 – this is one of very few remaining bottles of this outstanding dram and we both scooped it doon, beautiful. The final cask strength dram was the exclusive 18 year old Glenlivet. We sat down and chilled for a wee time and enjoyed some lunch. Lunch was followed by a session with an old friend, Charlie Maclean (Patron of our whisky club don’t you know), who gave an entertaining account of the visit to Edinburgh in 1822 by King George IV and how this led to the single malt that started it all. This visit by King George IV, orchestrated by Sir Walter Scott, was the first visit to Scotland by any monarch for over 180 years (even a German one sitting on a sassunach throne). When the said King asked for Glenlivet malt whisky by name this led to a change in the law which laid the foundations of today’s Scotch whisky industry. George Smith of Glen Livet was the enterprising illicit distiller who spotted the opportunity presented by the Excise Act 1823 and went on to establish his original Glenlivet Distillery at Upper Drumin. We also enjoyed a selection of special drams, some rare and drawn again from single casks. Charlie’s interest in Scotch whisky was originally stimulated by visits as a teenager to The Glenlivet Distillery and the surrounding area. The Glenlivet was the single malt that instigated his enthusiasm. At the end, Charlie gave us a personally signed copy of his book “Whiskypedia” which we had signed for a future guest of ours (we both have his book), so two of our guests – we know who they are – will find the books in their welcome packs. We rounded off a superb day of whisky experiences with a whisky dinner at Strathisla distillery, did we have another dram? Does a horse have four legs?